Secret Wars 3 is a really frustrating book, a book left me wanting to punch the entire enterprise in the face, flush it all down the toilet, and go blog about something else. But a promise is a promise. And if you’re like me, a lifelong Fantastic Four fan, you just can’t ignore Secret Wars and the effects on the Marvel Universe’s First Family, even if they twist my stomach in knots. 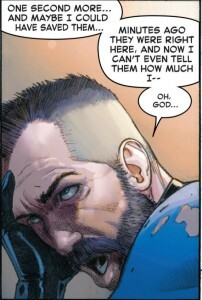 Mind you, I’m not accusing the author, Jonathan Hickman, of being a bad author; far from it, actually. He is skillfully weaving a tale that is breaking the last remaining Marvel taboos and isn’t playing games. Doom is a hero in Secret Wars. He really did save the universe, but at a painfully high price, his face. So, did the Beyonders cut off Doom’s nose to spite his face? 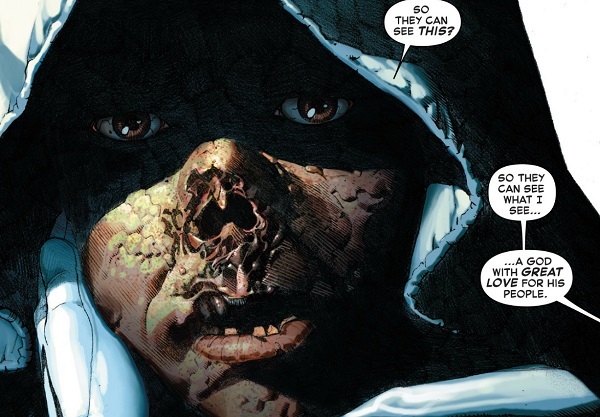 Bleeding Cool was the first I saw that pointed this out, that this is one of the great Marvel taboos, showing Doom’s scarred face under the mask. Of course, this really might not be the same thing. Marvel held off on showing what happened to Doom’s face when he first put on the mask, leaving open the question as to whether Doom’s face was ravaged during his college years, or whether it happened as an act of hubris when putting on a molten-hot mask for the first time. 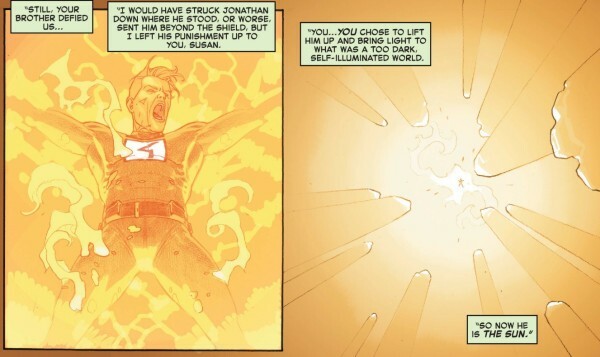 That question may now be moot, as his face may now have been damaged because of his confrontation with the Beyonders. And this is an act Marvel can always redress post-Secret Wars. But I doubt they can put this back in the box. Pretty picture, but my stomach is turning. 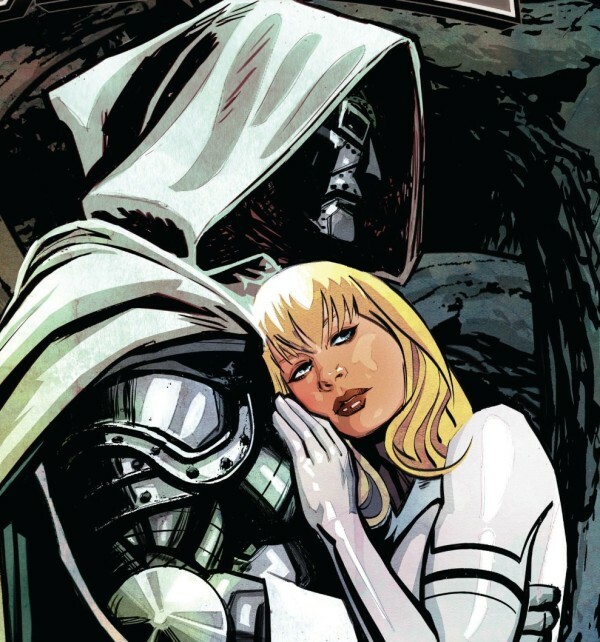 While the question of how deep the relationship between Sue and Doom really is in Secret Wars, Hickman makes it clear that Sue chose Doom, that she admires the man he is now, and that she so cares for him that she has consented to the torture of her brother for defying him. “He is the sun.” Chilling words. And as weird as it is that Doom is now the good guy of the Marvel Universe, it’s even weirder that Dr. Strange is going along with him, even as it’s clear that he recalls what Doom used to be. And has been doing so…for EIGHT YEARS. That’s right- the events between Secret Wars 1 and 2 happened eight years apart, as least as far as everyone but those outside the magic pods are concerned. For those who came in through the back door, it’s been an hour. One long hour for Reed Richards. And Reed doesn’t take the news very well..and he doesn’t even know about Sue yet. Marvel took time to give us all a peek at their new post-Secret Wars publishing lineup…and there was no Reed, Sue, or Johnny present. And that’s probably a good thing, because any such announcement would spoil the ending of Secret Wars, and no one wants that. But there was a teaser that Ben Grimm would join the Guardians of the Galaxy. And if Ben’s in space, he can’t be hanging out in the Baxter Building…so what will happen to the FF after Secret Wars? Moreover, what will happen to the family Richards/Storm? Will Secret Wars deal with the ramifications of the DoomSue coupling, or will it be washed away in the restoration to come? This is the closing joke for the first story in this anthology. That’s Howard the Duck, a duck, and Blade, a black man who kills vampires. I just finished a half-hour shower trying to figure out the words I could use to explain why that is such a terribly, unfunny, insensitive, indefensible line of dialogue. And then I looked up the author (David F. Walker), and realized that his sensitivity on the subject is probably different than mine. After all, he wrote this. He’s made a movie like this. 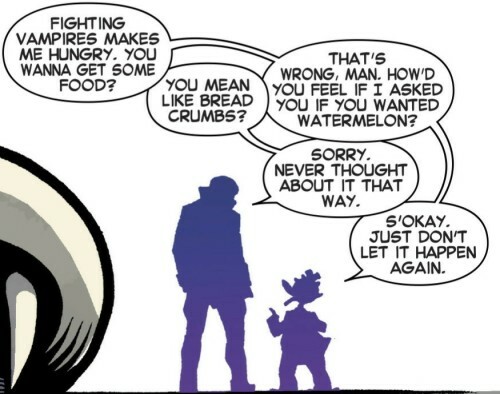 Chances are, he doesn’t have to read articles about why the watermelon trope is actually horrible. Wasn’t a fan of the second story either, but at least it didn’t make me take a 30 minute shower. So by my count, I have fifteen more books to review…so let’s hit you with that tomorrow, okay? OK. Previous Previous post: ROCK AND ROLL FRIDAY: Is It Sly or Is It Fries? Next Next post: Monday Morning Secret Wars 6: OK, it’s Tuesday, sue me.